Editor’s Note: The following is an in-depth exploration of the new Philadelphia Pennsylvania LDS Temple published by the Religion News Service. We were pleased to see that they went into such detail and treated the topic with such delicacy and kindness. The world’s newest Mormon temple, in the heart of Philadelphia, aims to embrace and shut out the city at the same time. Open to the public for a month before only Mormons may enter, the temple is an homage to Independence Hall, where the Founding Fathers drafted and signed the U.S. Constitution. 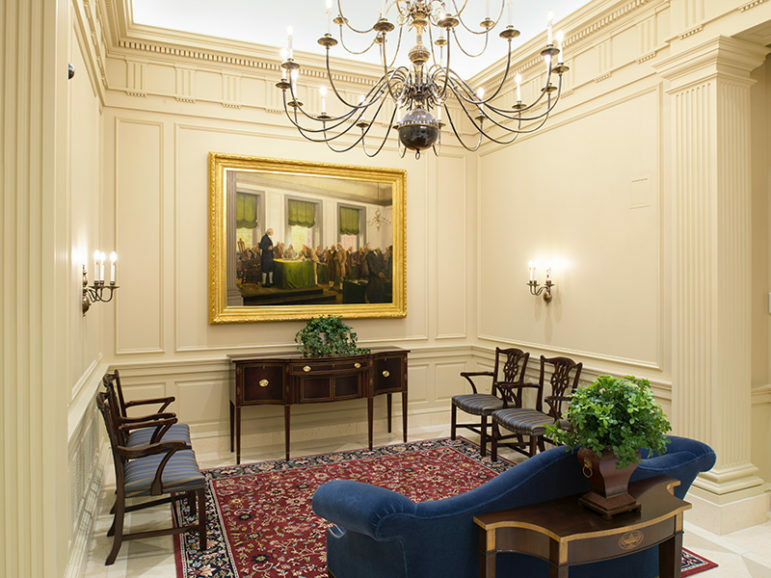 Mormons consider the document divinely inspired, and a church-commissioned painting of Benjamin Franklin signing it hangs in the temple’s foyer. Although this is the 152nd Mormon temple to be built, it is the one that most strongly connects Mormonism — one of the largest faith groups to be born in the United States — with the birth of the country. It’s an emotional tie for members of a church who have often been treated as a cult, outsiders in their native land. “We believe that part of the reason for the founding of this country was to enable a faith such as ours to be established and to grow and flourish the way it has,” said Elder Larry Y. Wilson, who directs temple building for the Church of Jesus Christ of Latter-day Saints, the official name of the Mormon church. From the painting to the details on the baptismal font railing, the Philadelphia Pennsylvania Temple, as it is called, honors not only Franklin’s city but also the state where the church’s first prophet was baptized and where half the Book of Mormon was translated.